The pinnacle of Light Weight Cast Wheel Technology. 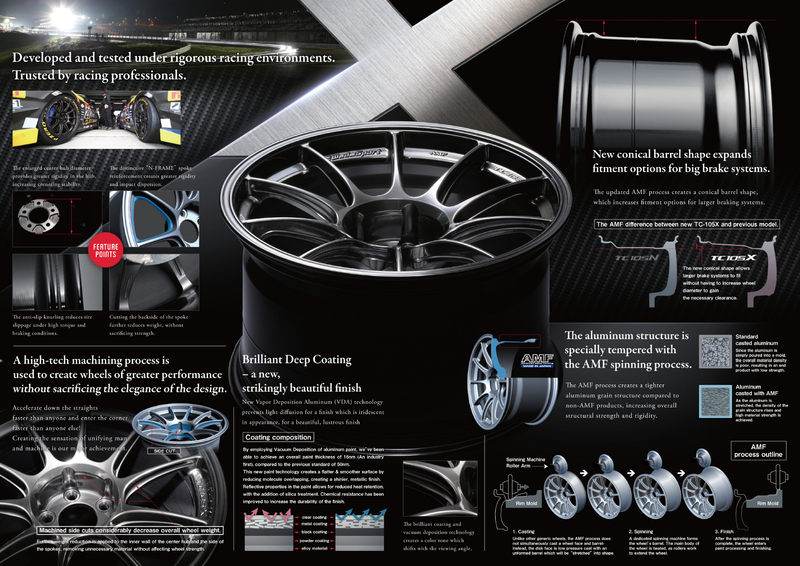 This is the new standard by which all racing wheels are measured. -Ball-Milling Side Cut: Increases spoke rigidity and strength while reducing weight. -N-Frame V.2: Reinforces spoke window and increases strength and rigidity. -Increased Hub Mass: Increases overall load capacity, rigidity, and strength for better steering response. -New Barrel Profile: Allows installation of larger brake systems and also improves overall strength and high speed stability. -Bead Seat Knurling: The knurling on the TC105X is more pronounced than before. This helps keep the tires from spinning on the rim which causes off-balance of rim and tire. -Multiple Face Type: Depending on size and specs, TC105X have multiple different face types available to accommodate various brake systems.